Studies have shown that company wellness programs and mindfulness training create higher job satisfaction, enhance teamwork and collaboration, and help create healthier work environments. In today's fast-paced, digital world, employees are working longer hours, taking fewer vacations, traveling more frequently for business, and spending numerous hours in front of a computer screen. As a result, it is even more important to integrate wellness and mindfulness into a company's work environment. 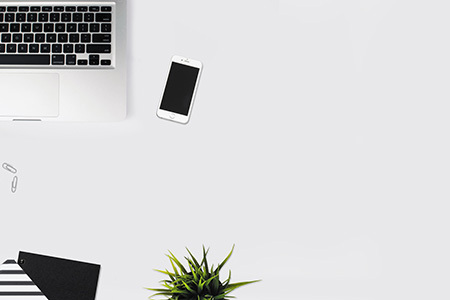 Employees who are healthy, calm, mindful and clear-headed are generally more creative, more productive and demonstrate more enthusiasm for their work, reducing staff turnover and increasing productivity. 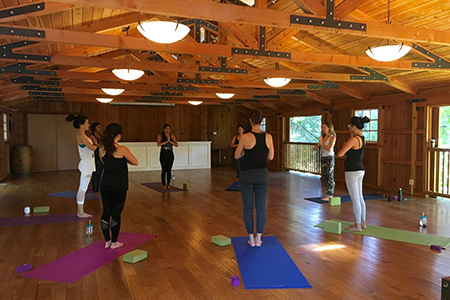 We offer a variety of wellness classes and services, either as one-off sessions at a company offsite or retreat, or as a regular weekly or monthly class. 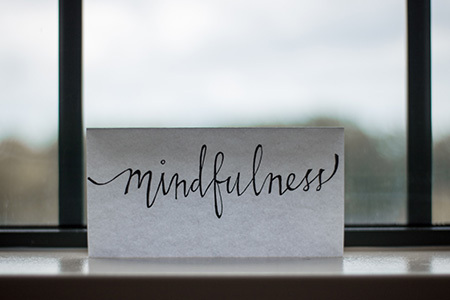 We offer Mindfulness Talks, Classes and Workshops, including sessions on: About Mindfulness, Mindfulness Meditation Practice, Breathing Techniques, and Practical Ways to Integrate Mindfulness into a Busy Daily Schedule. 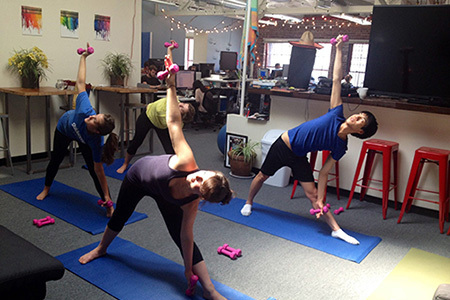 Our intention is to help you and your employees experience and enjoy being Mindful with a balance of effort and ease. Thales Teixeira, an associate professor at Harvard Business School and the publisher of Economics of Attention, says "The cost of attention is the most dramatic business expense increase in the last 25 years." He calculated that the cost of attention has increased 7 to 9-fold in real terms since 1990. He also quotes in a recent Harvard Business School study that "there are only two ways to capture attention; it can be purchased or it has to be earned." We help our clients improve employee attention and focus through learning, practicing and integrating mindfulness into their daily life. Our intention is to empower each individual to tap into their true potential and live each moment with greater intention, finding more clarity on how they can contribute and add value to the team, whilst collaborating more effectively with others. We lead day or multi-day company offsites and retreats and events, partnering with a variety of venues in Sonoma Wine Country and around the San Francisco Bay Area. We can also come to your location or your own event and lead any wellness sessions at your own offsite. 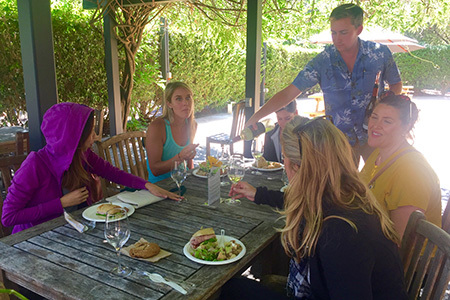 Treat your employees to a healthy, mindful and enjoyable company retreat, blending elements of mindfulness, yoga, nature and wine tasting if you choose! Our theme for corporate retreats is Connect, Collaborate, Create. We will work with you to design a unique experience for your group. Read more about our Corporate Retreats here. 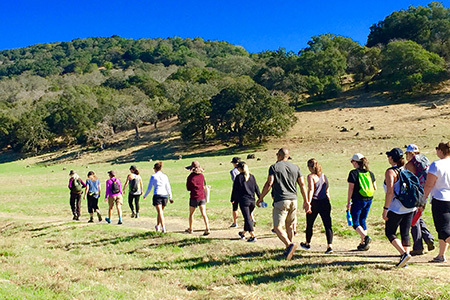 If you are not ready for a full day offsite or retreat, we love arranging 2-4 hour Wellness Walks, integrating Mindfulness, Meditation, Breathing, and some Yoga Postures during the walk. We can lead Wellness Walks near your office or at a beautiful location in nature. 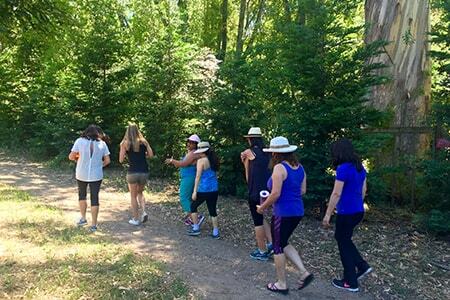 There are many beautiful trails around the San Francisco Bay Area and Sonoma and Napa Wine Country for our Wellness Walks. We offer yoga or chair yoga classes for all levels in the comfort of your office, a nearby park or rooftop or at your offsite event or retreat. We can work with you to create a custom program, that may include weekly, biweekly or monthly classes or sessions, or one-off events. Our yoga classes are suitable for all levels and are custom tailored for your employees' needs, including stretching, strengthening, breathing and meditation. Focusing on conditions caused by sitting at a desk and working at a computer, such as neck, shoulder, back and wrist pain, your employees will go back to work feeling more grounded, calm, relaxed and productive. 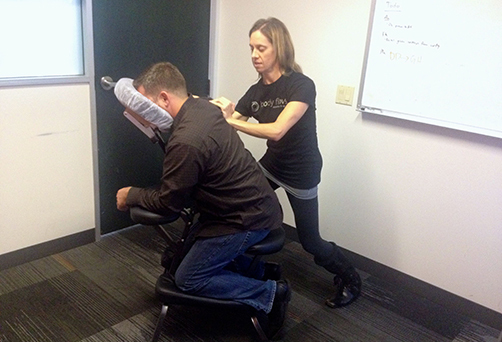 Taking 10-20 mins away from the computer and receiving a chair massage can not only help relieve aches, pains and tension, such as back and neck pain, wrist, hand and jaw tension and headaches and migraines, but also your employees will likely feel less stressed, happier, more productive and more positive when they return to their desk. Using a variety of therapeutic, sports massage, acupressure and shiatsu techniques, Body Flows chair massage is unlike any chair massage you may have experienced before. This is truly a therapeutic massage on a chair! We have worked with the following clients in the San Francisco Bay Area. Sonoma Community Foundation, Demandbase, Tradeshift, Guidebook, LightHouse for the Blind, FitApproach, Taulia, RocketSpace, Livefyre, MeCommerce, Peek, MongoDB, and FactSet.